The prewar Enfield and Alldays cars had been conventional designs, but for the postwar market the directors of the newly-merged company decided on something quite revolutionary. Known as the Enfield-Allday Bullet. It was announced in early 1919 at a price of £250, but by the Olympia Show in November the price had risen to £350. Two years in business and with no cars sold was not a recipe for success, and Bertelli was invited to join Enfield-Allday as general manager to sort things out. He designed a conventional light car powered by a 1488cc 10/20hp side-valve 4-cylinder engine and this went on the market in 1921. 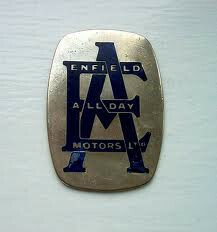 Enfield-Allday stuggled to sell around 100 cars in all and the company went into liquidation in April 1923. It was reorganised and relocated in a smaller factory at Small Heath, Birmingham.